Cause here’s the thing: I can turn on the TV or check social media any day and see women engaged in self-starvation, self-mutilation, racing to burn away evidence of having just grown an entirely new human, petty drama just to rack up ratings, or competition for a rose and a man. Women on TV often only exist in competition to tear each other down. The prize is always male attention. Women who lose that attention, women who have won it enough to become mothers, simply disappear. And if instead of disappearing, they keep getting attention, they’re bad mothers. This is what we see daily, until those magical holidays of female strength and power we call FIFA, Olympics, WNBA. And they really are like holidays because it’s hard to see footage of women—much less, mothers—building up and respecting their own bodies and respecting each other as admired opponents or loyal teammates any other time of year. 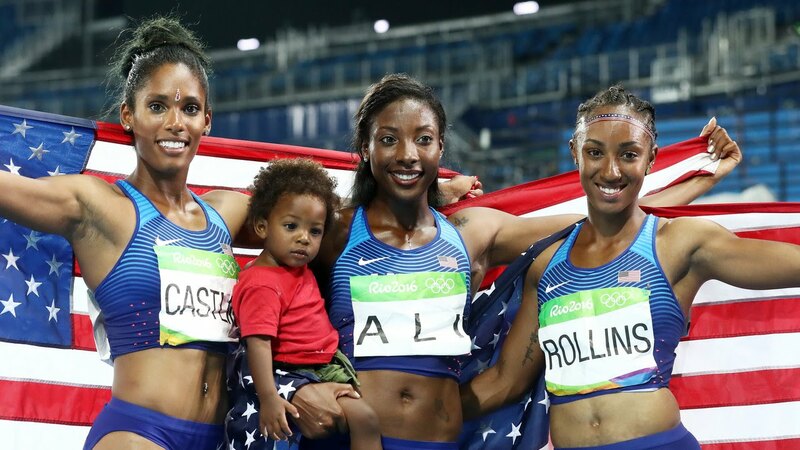 Last night the USA women’s track and field team swept all three medals in the 100m hurdles, and Nia Ali (silver) cradled her baby son as she spoke to NBC. I grabbed a screenshot just to be able to hold on to this moment because I need more moments like this, because it kind of feels like Christmas.